Since the beginning of systematic monitoring, the number of recorded victims of violent antisemitic attacks is as follows: 8 victims in 2004, 13 in 2005, 8 in 2006, 8 in 2007, 5 in 2008, 1 in 2009, 1 in 2010, none in 2011, 4 in 2012 (three incidents), 4 in 2014, also 4 in 2014 and 1 in 2015. 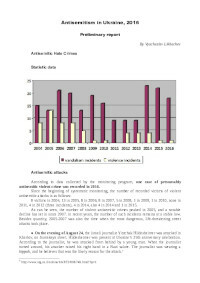 As can be seen, the number of violent antisemitic crimes peaked in 2005, and a notable decline has set in since 2007. In recent years, the number of such incidents remains at a stable low. Besides quantity, 2005-2007 was also the time when the most dangerous, life-threatening street attacks took place. The label “vandalism” is applied in this report for two categories: physical damage, such as broken windows and arson attempts, done to buildings that are part of the Jewish infrastructure (synagogues and community centers), tombstones in Jewish cemeteries and Holocaust memorials, and antisemitic and/or neo-Nazi graffiti on similar objects, which are evidence of ideological motivation. 18 cases of antisemitic vandalism were recorded in 2016. A detailed description of these incidents can be read above, in the chronicle of vandalism. The number of recorded incidents of antisemitic vandalism since the beginning of the monitoring is as follows: 15 cases in 2004, 13 in 2005, 21 in 2006, 20 in 2007, 13 in 2008, 16 in 2010, 9 cases each in 2011, 2012, and 2013, 23 cases in 2014 and 22 in 2015. Thus, in 2015-2016 there has been a slight reduction in the number of acts of antisemitic vandalism in comparison to the 'peak' year of 2014. The report also details incidents of hate speech and antisemitic discourse.